Statement of Non-Profit Status: The Society shall be a general not-for-profit organization as described in the appropriate sections of the Internal Revenue Code of the United States of America and shall meet requirements set forth in that Code. In light of the acceptance, by the Advisory Officers, of the Bylaws and Constitution of the Society of Early Americanists, we the undersigned, Executive Officers of the Society of Early Americanists, confirm our acceptance of the said Bylaws and Constitution. In a general meeting, we will discuss the Bylaws and Constitution with the membership and thereafter conduct a vote before the membership on the general acceptance of the Bylaws and Constitution. 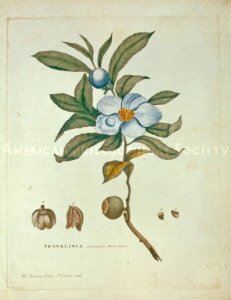 William Bartram (1739-1823), Franklinia alatamaha, American Philosophical Society. Permission to publish required.